As we know, the electromagnetic field (EMF) associated with a plane polarized wave can be modelled by two same frequency plane fields (electric and magnetic) whose planes are perpendicular. We have said « modelled by » and not « constituted of », because if we create and associate an electric field on the one hand and a magnetic field of the same frequency on the other hand, we will not obtain an EMF ! The electric field and the magnetic one have no interaction, moreover, these two fields decrease as the square of the distance whereas a true EM field decreases as the distance. It is the power per surface unit of an EMF which decreases as the square of the distance as it results from the formula of the surface area of a sphere (if there is no loss and for an isotropic transmission). However, among EMF manifestations, it is possible to identify two fields corresponding to those of the model (and pick them up). To pick up the electric one we use an antenna and an induction coil or a “loop” (sometimes improperly named loop-antenna) to pick up the magnetic one. In the special case of extremely low frequency (ELF) waves, i.e. for less than 40 Hz frequencies, the wave length is in the range of tens or hundreds of thousands of kilometres ( ), and, ideally, the antenna length being of the same order of magnitude, it's judicious to attempt to use the earth as an antenna in order to pick up the electric field by means of two electrodes plunged into the soil. The exact nature of picked-up signals is moot and it's not the place to raise concerns (on this matter, read http://www.vlf.it/ed/earthprobes.html). However, it must be observed that the method is used by professional geophysicists (with non polarizable electrodes) to pick up the E component, at least in the ELF range and espescially in a low-polluted environment (see for example the Annales geophysicae publication called Schumann resonance frequency variations observed in magnetotelluric data recorded from Garhwal Himalayan region by R. Chand, M. Israil, and J. Rai(2). It's possible to find a description of such a system for example at the URL http://www.elfradgroup.com/index.htm. . It's also possible to use a Marconi antenna (much shorter) as described at http://www.vlf.it/cumiana/livedata.html. If we choose to pick up the magnetic component, as we have said, there are two possibilities for the sensor : the classic one, used by universities, which consists of using a long coil wound on a high permeability core such as mu-metal or permalloy. But these ferro-nickel alloys are expensive and difficult to obtain. To make this classical version in an economic way, see http://www.vlf.it/matteobruna/ULF_Induction-Coil.htm . There remains the loop solution. The general theory of loop antennas is given at http://sidstation.loudet.org/antenna-theory-en.xhtml and we will refer to this extensive text, from which it is necessary to extract the matter which interests us. one picotesla for the first Schumann Resonance (SR)(3), to compensate for the poor air permeability the loop size must be important (about one square meter or more) as well as the number of enamelled cooper wire turns. As Renato Romero remarks with salutary insistence, the microphonic effect is a major obstacle to weak signal visibility. Hence, it's absolutely necessary to limit vibration transmissions to the loop as well as possible. The first originality of the system described in these pages consists in the use of a heavy concrete frame to constitute the loop frame. The second originality lies in an embedded recorder which allows the system to be used far away from 50 Hz power lines and suppresses the presence of a PC, which, as we know, also generates electromagnetic pollution (EMP). As we shall see, the obtained results seem good, the microphonic effect is practically absent and the first SR very legible as we can see in the waterfall beside. 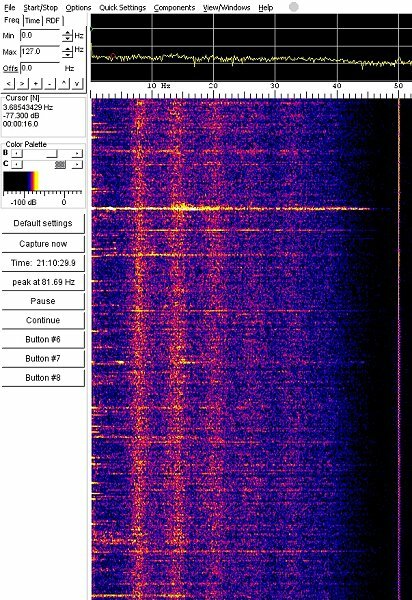 Spectrogram(4) of an hour's recording in a forest in the North Limousin, France(5). The 5 Schumann resonances are clearly visible(6). To obtain a maximal flux, and thus a maximal induced voltage, the magnetic field must be orthogonal to the loop plane. 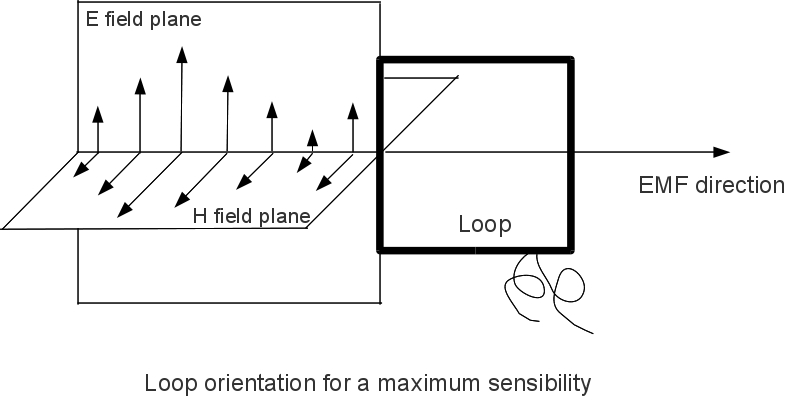 Therefore to pick up a plane polarized EMF, the loop must be in the electric field plane. But in real practice, we do not know the nature of the numerous EM waves where we pick up the magnetic component : some may be plane polarized, other circular polarized, elliptic polarized, or … not polarized. Even if we consider only plane polarized waves, the polarization plane (which is the E field plane) may be vertical, horizontal, or … inclined. So that, it's impossible with just one loop only to determine the EMF direction. With two distant loops, if we are certain to be in the presence of a vertical polarized wave, it's possible to determine the source position (if it's single and defined !) orienting each loop so that the picked up signal be maximal : it's at the two loop planes intersecting. Even in the hypothetic case of a transmitter with a corded antenna, the loop location with regard to the transmitting antenna must be taken into account. Indeed, the classical EMF model described above is only avalaible at a certain distance of the transmitter. 1°/ The reactive zone (or near-field) in which the E and H fields are dephased of ; then, the complex Poynting vector (and power) is purely imaginary. 2°/ An intermediary zone (or Fresnel Zone) where the Poynting vector has a non-zero imaginary component. 3°/ The Fraunhofer zone (or far-field zone) in which the Poynting vector is purely real, E and H in phase and orthogonal. It's the standard situation which corresponds to the classical EMF model and Poynting vector gives the wave propagation direction. There exist formulas which define approximatively these two zones as spherical crowns centered at the middle of the antenna. Particulary, the Fraunhofer zone is characterized by the formula , where a is the antenna size and R the distance between the current point and the antenna centre. Unfortunately, it would be foolhardly to apply this formula in the ELF case, because if we go back to the proof(8), we can see that, as often in physics, various approximations and hypothesis have been made to simplify the calculations. In particular, it has been suposed that and . It is sufficient to consider the value to see how wild our hope to use these formulas were. Indeed, these formulas are, above all, used in optics and in the RF domain. However It would be useful to hold studies then the antenna size is small or very small with regard to the lengthwave, because all picked up ELF signals are not transmitted from the ionosphere or from the earth, but from various wires or human-sized devices. Thanks to Renato without whom I would have forgotten to talk about that problem. 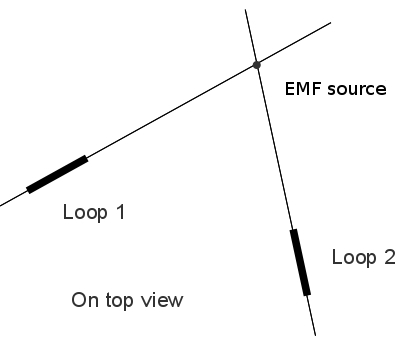 In reality, this type of use holds little interest for us and we must abandon the hope to realize a transmitter finding system with one loop (or even two), principally because we do not know the picked-up wave nature and EFL sources are not ordinary transmitters with a classical antenna (the antenna may be the ionosphere). So, we must consider the magnetic field picked up in itself, and that is what we will study. If we want to rebuilt it, we must use three loops where the normals are respectively directed N-S, E-W and upward. If the loops and signal conditioners are identical, we will have the three components of the complex magnetic field picked up. Submitting these components separately to spectral analysis, it's possible to identify determined signals. From that, and knowing the three magnetic field spectral densities, it could be possible to have approximately as a vector for such a signal, and perhaps deduce some information about its source. For more information, cf. http://www.vlf.it/rdfatvlf/rdfatvlf.htm . I specify that I have not done it and for the moment I content myself, with only one loop where the normal is N/S directed (to pick up ) or E/W (to pick up ). 1°/ Good electrical performances allowing to easily pick up the SRs. 2°/ A car transportable system, where each different part can be handled by one man (even if two are preferable !). 3°/ A perfect stability and a wind insensibility to avoid the microphonic effect as much as possible. 3°/ A reasonable cost. However, the loop is the most expensive part of the system. In fact, if all these conditions were more or less reached, it certainly was not at the first attempt ! My first loops, with wooden frames, were neither sufficiently stable nor sufficiently sensitive. I must thank Renato Romero, whose famous page http://www.vlf.it/minimal/minimal.htm constitutes an obliged passage for the beginner, for the kindness, patience and competence with which he has often lavished judicious councils, allowing me to progressively improve my system. I need to say that if several critical points are not correctly treated, the desired results will not be achieved. Especially I had under-estimated the length of wire to wind and the importance of the microphonic effect. The threshold of sensitivity and the signal/noise ratio obtained by (imperfect) calculation are perhaps more optimistic than the real ones and it was necessary to lengthen the wound wire by three times. It's not worth describing the first imperfect versions. I will now describe the actual efficient version. I have chosen 0.4 mm enamelled wire, which is relatively thick, to obtain a low resistance in order to minimize the thermal noise due to the loop and enhance the Q quality factor. This wire is sold in 400-meter-long coils weighting 500 grams. Finding such coils at electronics suppliers' at a reasonable price is not always easy but possible(9). I've experimented that a length of at least 6000 m (i.e 7.5 kg) is necessary to obtain good results with a pre-amplifier mainly working in voltage(10). This represents 15 small coils of 400 m. It's easy to join these lengths end to end because the varnish is destroyed by the solder heat. However It is necessary to lightly sandpaper each extremity before twisting them together and wait a few seconds for the varnish to burn, which is visible by the emission of a pungent smoke ; a 50 W minimum soldering iron with a flat tip is necessary to bring and maintain a sufficient quantity of heat. To isolate the junction, I used a tiny piece of electrical adhesive tape but it's possible to use a special varnish. For evident reasons, any presence of iron or magnetic metal is prohibited, that's why, in particular, the concrete is not reinforced. We subsequently can see how to palliate this difficulty. This frame, which is a main part must be made with special care : the mould must at once be very precise, solid (to be able to resist any chocks and vibrations without deformation during the concrete filling) and designed with the problem of removal and shrinkage in mind. Indeed, during setting, the concrete retracts and its size decreases while the wood keeps its length (in the fibre direction) therefore the inner mould tends to prevent the retraction and may cause the concrete to break, so, remove the moulder with care a few days later (about a week) after the concrete filling without warping the frame. 1°/ Fibre-reinforced concrete (with polypropylene or glass fibres). It's possible to make the mix oneself, but it's easier to buy it in bags (generally weighing 30 kg) ready to use. I recommend adding a small quantity of cement to the bags content to get a 400 kg/m3 cement dosage. The fibres won't replace steel but will improve cohesion and reduce shrinking. It's necessary to (moderately) use remoulding oil to prevent the concrete from sticking to the wood. The concrete must be prepared with a minimum of water (compatible with sufficient plasticity) to minimize shrinkage and the mould repeatedly hit with a hammer to remove air bubbles. Make sure that the concrete penetrates everywhere. This operation needs to be repeated several times at in-between rest periods. After setting ( for a minimum of three weeks, place the mould on a flat and fixed support), glue the fibre glass textile after carefully removing the remoulding oil rests and the thin layer of the cement laite, which has no resistance. A resin quantity of 800 g is a minimum requirement, although 1 kg is preferable. Proceed with placing the fibre glass textile in strips side by side (as it's impossible to bend it). Spread the resin with a spatula or a small roller over the concrete, place the fibre glass textile strip, then press it with the spatula or the roller chasing out the air bubbles (important and not always easy; do it again several times, as the textile has a tendency to raise itself if air remains under it) and lay a new resin coat above. It would be preferable to use fibre glass textile specially adapted to concrete reinforcement, but confronted with the practical impossibility of finding any in small quantities, I used solid fibre glass wallpaper. I staggered this operation on several days. The weight of the frame without the coil is about 32 kg. Also in fibre-reinforced concrete, they are 14 cm thick and each of them weighs about 30 kg. There is no need to cover them with fibre glass textile. A layer of rubber is stuck to the bottom to receive the frame (which has also a rubber strip in the bottom). For recordings, they lie on the ground coated with a levelled sand bed. As the frame is a somewhat thick than the supports fences, I used wood wedges to block the frame. When the epoxy resin is dry, put the PVC trunking (30 x 20 mm) into its groove using a polyurethane glue such as Sikaflex© and cover the 4 inner angles with a good electrical tape to avoid the wound wires(11). Make a wooden cross with a hole in the centre and fix it to the concrete frame to wind the coil. The wire must be stretched enough ; for this I used a kind of felt press-wire between the loop and the small cooper coils. It's necessary to maintain the wires in the trunking place to place with small electric adhesive strip pieces. It's unprofitable to try to obtain joined turns because it's almost impossible and it would increase the distributed capacity. When the coil is achieved (about 8 h), the best would be to impregnate it with epoxy resin, but I have not done so in order to recover the cooper in case of necessity. I have used flat wood sticks hardly jammed between the cooper and the trunking cover to immobilize the turns. I stuck thick rubber strips onto the parts of the frame (outside the trunking) which must be in contact with the concrete supports, in order to limit the transmission of ground-originated vibrations. The best would be air cushions(12) but I did not succeed in finding any. The pre-amplifier box (a PVC waterproof derivation box) is glued to the exterior of the frame with polyurethane glue. The medium length of the side coil is 0.96 m, its area A is 0.92 m² and its turn number N is 1560.
of the loop, measured at 20 °C is about of 870 Ohms. N.B. 1°/ This method is approximative for two reasons : 1°/ The modelling of a real inductor by a pure inductor and a capacitor in parallel is questionable and sometimes gives aberrant results ; 2°/ the resonance point determination is lacking in precision. For these reasons, it's prudent to remain with only two significant digits. 2°/ It's interesting to compare this result with the one calculated with a formula. I have not found serious formulas giving the inductance of such a multilayer square coil (warning : there are fanciful formulas on the web !). Only to have a size order, I tried to apply the formula given by http://sidstation.loudet.org/antenna-theory-en.xhtml : (e is the coil width – here 0.03 m -, K the square side in meters and N the turns number) valid for a single layer coil(15). I obtained 7.3 H exactly as before, which shows that this value is probably near to truth. 3°/ Now, we can try to evaluate distributed capacity from the resonance frequency. This one, measured as before, is about(16) 835 Hz. Hence, the distributed capacity is about . If we model the real inductor by a capacitor C in parallel on a pure inductor L in series with a resistor R, the impedance Z of the real inductor is (17); if C is negligible, we obtain . But, is it really pertinent to neglect C ? Here is Maple worksheet, which shows that the answer is yes in the frequency band [0, 40] if we content ourselves with some per cent precision. Hence, it's pertinent to neglect the distributed capacity. Afterwards, we will adopt . Cut-off frequency and quality factor Q. The loop modelled by an inductance L in series with a resistor R may be seen as a high-pass filter whose cut-off frequency is . Supposing that the resonance frequency is 835 Hz, we deduce that the quality factor is . The spectral density of noise voltage of a resistor R is given by the formula (18), where R is the resistance, T the thermodynamic (absolute) resistor temperature ( ) and the Boltzmann constant ( ). It's expressed in . If we apply this formula to our loop, we obtain, for and : . It's necessary to specify that voltages here considered are RMS voltages. Loop properties as a voltage generator. 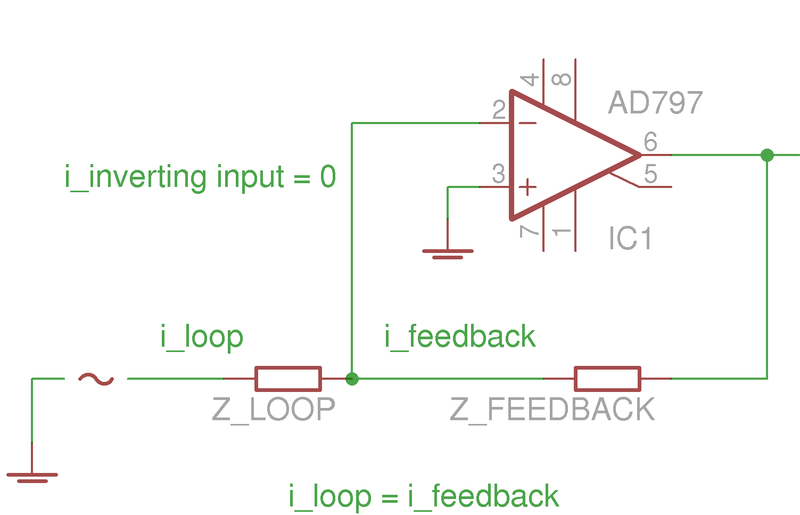 We have voluntarily omitted the bias resistor R1 on the non-inverting input which figures in the pre-amplifier schematic, because it has no effect on the present considerations. We know that the potential difference between the inputs 2 and 3 is nil. Hence the loop is short-circuited and the current which goes through it is the quotient of the induced voltage by its impedance. Now, we will calculate the induced voltage, the loop current and its transfer function with regard to the magnetic field which goes through the loop. At every fixed time t, the magnetic field is constant in all the points of the loop section. The magnetic field maintains a constant direction when t varies. If i is a unitary vector of arbitrarily fixed, is given versus time by the formula with and . The magnetic field intensity is expressed in teslas (T)(20). is a unitary vector arbitrarily fixed, normal to the loop plane. is the non-oriented angle of and ; it's defined by its cosine : (usual euclidean scalar product). A is the loop area in m². In these conditions, the component of vector with respect to the unitary vector is given by and the flux of the magnetic field through the loop N turns is . To determine the loop transfer function, it's judicious to use complex amplitudes because the classical Op-amps DC formulas stay valid in AC with complex formalism. Now, b is complex and function of . Hence, the supraconductivity interest. I recommend reading the interesting considerations on that subject developed by Marco Bruno at www.vlf.it/looptheo7/looptheo7.htm (although my attempts to implement a very low impedance loop able to receive SRs remained vain). However, in spite of the handicap of the loop response curve non horizontality, the practical results obtained below 10 Hz remain good. To know the SR levels, I referred to the article : Schumann resonance frequency variations observed in magnetotelluric data recorded from Garhwal Himalayan region by R. Chand, M. Israil, and J. Rai free (in Annales geophysicae) available as a download on the WEB(21). The level and the exact SR frequencies change according to the day hour and the season, but we can see that the value of the N-S component magnetic field spectral density peak of the first resonance, which is centred about on 7.83 Hz (8 Hz to simplify), is about RMS and RMS for the fifth, which is centred on about 26 Hz. I will evaluate the signal to Noise Ratio (SNR) at the pre-amplifier input to see in what extent the SR level exceeds the noise one. The input noise (outside exterior EM perturbations) has two sources : the loop thermal noise and the pre-amplifier OPAMP noise. To evaluate it I used the Analog Device study Operational Amplifier Noise, available free as a download on the WEB and the AD797 data-sheet. The AD797 choice pertinence appears on figures 4 and 13 considering the input impedance and the frequency range. The data-sheet fig. 1 plots the AD797 input noise versus frequency. We have a 1/f pink noise below 200 Hz. Thus that case occurs for all SRs. Unfortunately, the plotting stops at 10 Hz but an approximate extrapolation shows that the voltage noise spectral density at 8 Hz is about (without certitude). The data lacking is the same regarding the current noise. Input voltage noise density : (approximate evaluation : we are in the pink noise OPAMP zone). Loop thermal noise density : . Total noise density : . Signal RMS voltage density : since the induced voltage and the magnetic field are both sinusoidal, their RMS value is obtained by application of the same coefficient to the peak value. The formula (3) of the Maple worksheet above shows that the RMS induced voltage is for . For f=26 we find : rms, which corresponds to a spectral density of . Signal to Noise Ratio (SNR) , which is here bandwidth independent : . Input voltage noise density : (we are in the pink noise OPAMP zone). Voltage noise due to current noise flowing in the loop. ; I admit (perhaps foolhardily) as above the same at 26 Hz to continue calculations. In these conditions, the sought voltage noise density is always . Signal RMS voltage density : we find here . Signal to Noise Ratio (SNR) : . Conclusion. The calculations confirm the experience : the SRs are discernible with the system. The pre-amplifier is embedded on the loop to avoid losses. The quality of this pre-amplifier is a determining factor to “extract” the signal from the noise. These noises are essentially the resistor thermal noise (of the loop and of the pre-amplifier), and the noise of the OPAMP used. I chose an ultra-low noise OPAMP (Analog Device AD797) and I relatively limited the voltage gain of this stage to about 207 (or 46 dB). As said and as it's visible on the photo, the pre-amplifier box is glued onto the loop frame side. The presence of any magnetic metal is disallowed in the practical realization, in particular, screws are in brass and I omitted the chock coils traditionally inserted into the loop input circuit to kill an eventual crossing modulation in order to avoid a ferrite presence near the loop. Till now, their absence has not been harmful in the places where I have recorded, but it can be the case elsewhere. A 4 twisted pairs FTP 5e Ethernet wire implements the junction with a box containing the two 12 V batteries which powers the system and the rest of electronical circuits. The shield is not connected. I have tried a 2 m wire and a 30 m one. The results have remained good with the 30 m wire, but they have been a little lower than with the 2 m one. 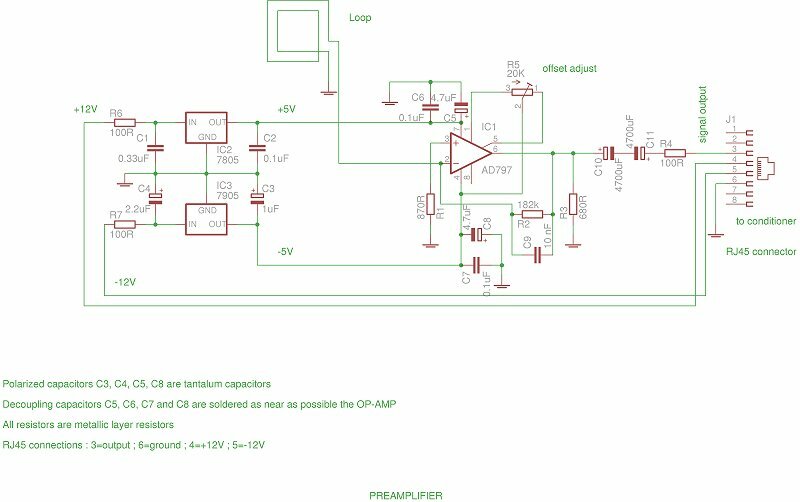 Notice that the feedback resistor R2 is decoupled by a 10 nF capacitor C2 to provide a first attenuation of “high” frequencies, since this couple acts as a first order low-pass filter with a cut-off frequency of . The 2350 uF liaison capacitor is implemented with two head to tail assembled 4700 uF electrolytic capacitors. These capacitors are useful because the R5 offset adjustment is temperature dependent, which may variate strongly since the pre-amplifier is located outside. The 100 Ohms impedance adaptation resistor R4 was determined with regard to the input impedance of the conditioner first stage after various experiments. I have neglected the roll-off for frequencies approaching zero due to the 2350 uF liaison capacitor. N.B. This last formula will be used in part II to calculate the global transfer function of the receiver. 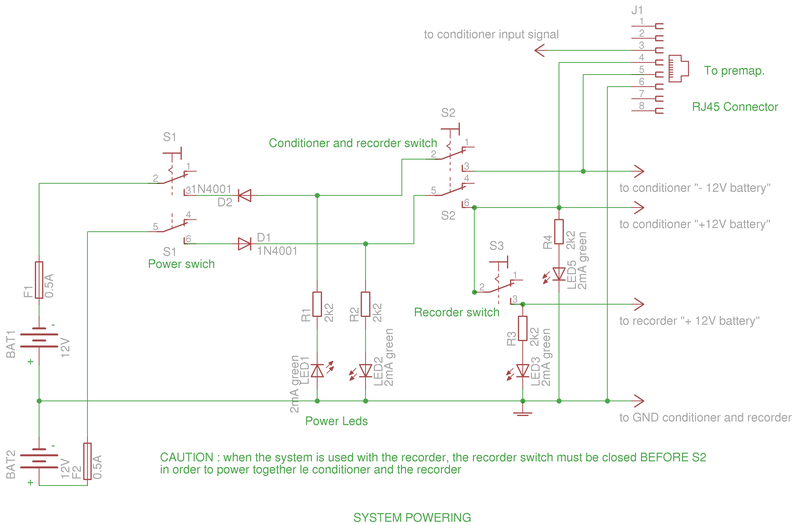 The system (pre-amplifier, conditioner, and recorder) is powered by two 12 V 7Ah lead-acid sealed batteries located in the bottom of a plywood box which contains the conditioner and the pre-amplifier in the upper part. These batteries perform well in spite of their low price but need to be charged with care, respecting the charge voltages for the upper charge and the floating charge. In practice, it's indispensable to make a specific dual charger for them. To save time it's possible to utilize the F5JTZ schematics at http://f5jtz.free.fr/pjacquet/ch-sla.htm, which are excellent. All leds are low-consumption ones (“2 mA”). Battery voltage monitoring is performed by the 10 bit A/D converter included in the recorder MCU. In fact, only one battery is monitored, the one which is the most solicited (the recorder uses only one battery). This system – non-indispensable - will be described in part 3. The global consumption measured is about 45/50 mA without the recorder and 80/85 when the recorder is active. Therefore, we have more than two days of autonomy with 7 Ah batteries. 1) Part 2 is dedicated to the conditioner (filters) and part 3 to the SD card recorder. 2) Ann. Geophys., 27, 3497-3507, 2009. www.ann-geophys.net/273497/2009/. Without entering in controversy, it is easy to observe that spectrograms obtained with electrodes are not superimposable with those obtained with the induction coil. Since there are only two components for the EMF field, we are able to think that the picked-up signal with electrodes is really the E component. Naturally, to explain how the « earth-antenna » works is another problem, tackled by Renato in http://www.vlf.it/ed/earthprobes.html. 4) The FFT tool used is Spectrum Lab V2.76 b13, nicely adapted by Wolfgang Büscher to allow reading of my raw file (cf. Part 3 for more details). The FFT resolution is 0.062 Hz (4096 points) and the effective sample rate is 254.5 sps (nominal : 256). Notice that such a quality involves a weak level of ionospheric disturbances, in particular absence of magnetic storm. 5) 63' 42 '' recording 2011-05-16 realized at 46°16'48.81''N – 1°40'38.44E – alt. 516 m from 13H20 UTC. 6) Several horizontal lines are due to car passing on a road a few hundred meters away. We can state that the Schumann frequencies are in accordance with the ones indicated in the classic scientific literature. In particular, the first SR is centred about on 8 Hz, and has NOT increased to 12.5 or 13 Hz as claimed by the New Age gnosis. 7) Here, the FFT tool used is Baudline (http://www.baudline.com/). 8) Cf. for example J.-J. Labarthe, Electrodynamique classique et quantique, Université de Paris-Sud Orsay (free downloadable), pp. 107 sqq. 9) I If necessary, contact me for an address. 10) I'd obtained poor results with a pre-amplifier mainly working in current (with a shorter loop), but I don't mean it is impossible. 11) Not all PVC trunkings are well adapted to this work ; avoid those whose sides intrude too much. Ideally, in place of trunking , it would be better to use PVC U-profile without the clipped top and close them by filling with resin. 12) I can send a study on the vibrations stopping problem in French, if requested. 13)An oscilloscope did not give me a better precision. 14) In fact Maple gave a lightly negative result. 15) Considering its low value (see http://sidstation.loudet.org/antenna-theory-en.xhtml) and the approximations made besides, needless to consider the wire inductance. 16) Measure results are not constant , the maximum voltage is not much marked and difficult to determine. Which is equivalent to the above formula. 18) Deduced from the Johnson-Nyquist formula : in which is “the noise passband”, V the “noise voltage on the frequency band ”. This formula is very simple and classical but however its term meaning must be well understood. Under the effect the thermal agitation of its electric charges, a resistor in thermal equilibrium acts as a v(t) voltage generator. For statistical reasons, the mean value during a time of this variable voltage v(t) is nil (the electrons don't know privileged direction in their erratic motions), but not the RMS voltage . This voltage v(t) can be expanded into elementary sinusoidal functions according to the Fourier theory. It's generally admitted that all frequencies are equally represented (white noise). But, only the component frequencies included in the frequency band which interests us will be harmful to us.If we name V the RMS value calculated on the frequency band at the resistor terminals, the Johnson-Nyquist formula occurs. It's the voltage which would be indicated by a RMS voltmeter with an exact – no more and no less - band pass connected to the R terminals. The term density is justified : for all physical quantify (homogeneous), a density is always the ratio between the measure of a certain portion of this quantify and the measure of another quantify on which it depends. For example, the volumetric mass density of a solid is the ratio of its mass by its volume, or, its mass per volume unity and is expressed in in the MKSA system. In the electrical noise case – as resistor thermal noise -, which is bandwidth dependent, the noise power spectral density is the noise power per unit of bandwidth, i.e. per Hz. It's homogeneous to a voltage square divided by a frequency unit, and thus, expressed in . If we take its square root to give voltages instead of powers, we obtain the voltage spectral density, which is expressed in . Then, we have . 19) On the op-amps, I recommend the Texas Instruments free document Handbook of Operational Amplifier Applications. 20) Don't confuse the magnetic field expressed in teslas and the excitation magnetic field , expressed in . 21) It seems that an inversion occurs in curve colours Hx and Hy. 22) Remember that, with op-amps, the supply voltage limits generally at its proper value the maximum output voltage.